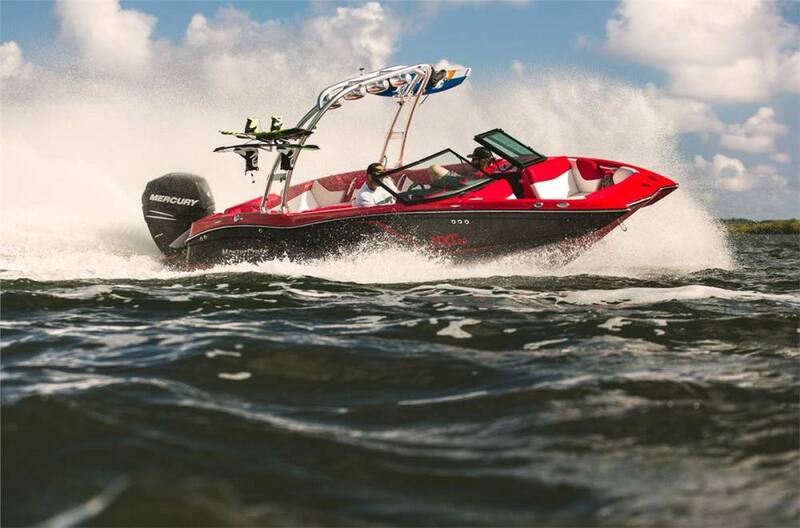 MasterCraft reinvents its venerable ProStar slalom ski boat for 2014. 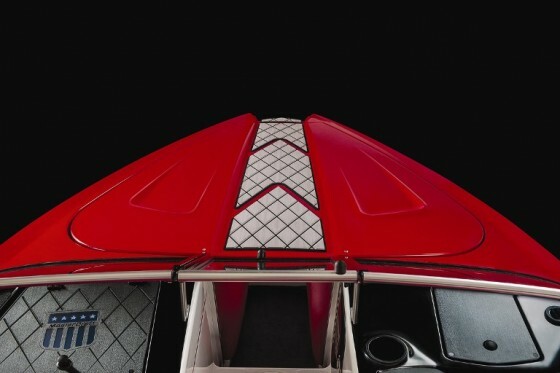 Even though it seems like only yesterday that Nautique debuted its Ski Nautique 200 slalom boat, that was 2009 and it was the last new ski boat to debut. In fact, we hardly ever see a new slalom boat these days. That says a little something about the dynamics of the slalom skiing market—but make no mistake, it still exists and its denizens are a discerning bunch. 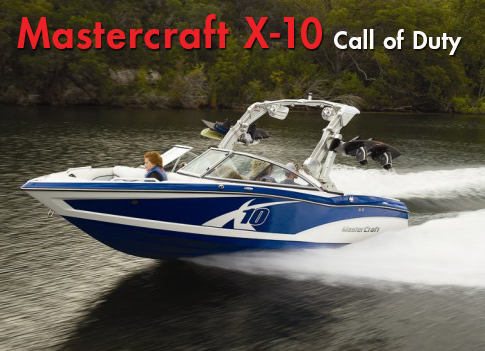 Mastercraft probably knows this better than any inboard manufacturer, and its new-for-2014 ProStar (MSRP $68,700) is proof that it hasn't forgotten the slalom jocks out there. 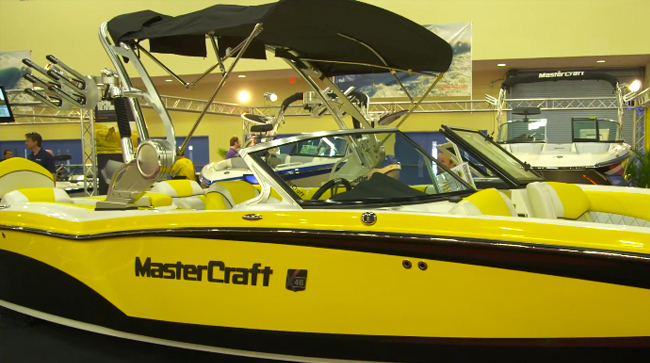 MasterCraft was founded on slalom skiing, after all. Last redesigned for the 2001 model year, the outgoing ProStar was certainly competent. It’s the only boat ever certified for all five USA Water Ski events and has pulled more world records than any other boat. That’s an impressive statistic, but when you look at the 2013 ProStar and compare it with, well, practically every other high-end inboard on the market, it was certainly due for a refresh. 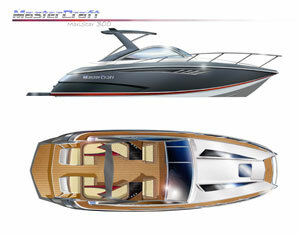 And Mastercraft did a masterful job. Slalom skiing is an established discipline, which makes innovation in new models like the MasterCraft ProStar more difficult. Slalom jocks always want softer, flatter wakes and less spray at shorter line lengths. That leads to hull changes no one can really see, but any new boat likely will still be a direct-drive inboard with a closed or open bow. The interesting thing about the new ProStar is that one model can be both. That points out the first innovative feature of the new ProStar. It’s fitted with a bow cover that converts it to a closed bow model. It works well and looks good. When the cover is in place, the new ProStar really looks like a closed bow, with faux scoops to either side of a rubberized walkway. With the cover in place, the ProStar is an enclosed bow ski boat. That walkway leads to the bow, which features an interesting design treatment. Call it the world’s narrowest pickle fork. It’s not easy to execute those kinds of creases in an open molding process and is a testament to Mastercraft’s lamination capabilities. Well done. Sans cover, the MasterCraft ProStar offers bow seating. The interior also is well done, and perhaps where the new ProStar shines most brightly over the model it replaces. 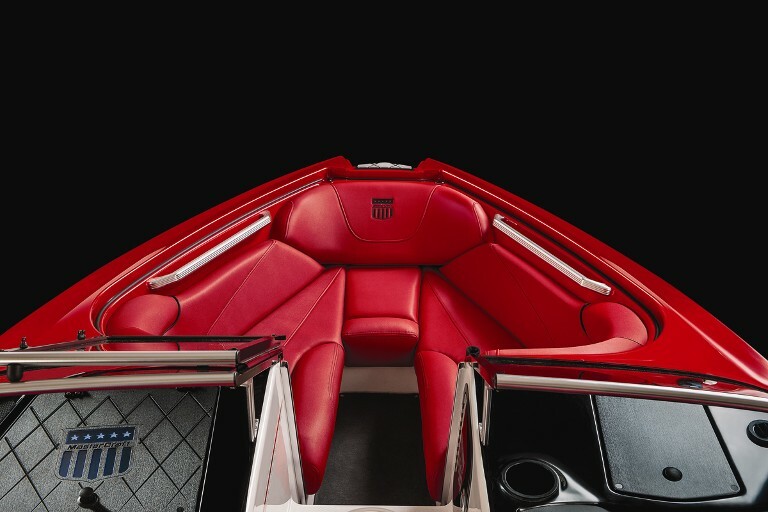 The vinyls used on the upholstery are a huge leap forward, as is the helm, which is about as futuristic as you’ll find in any boat. For example, there are no gauges on the dashboard. Yes, there is an analog gauge for fuel level, water temp and oil pressure, but it’s tucked into the gunwale down and to the right, just forward of the throttle/shifter. All systems on the boat are controlled via digital touch-screen display to the right of the steering wheel, and there’s a stereo controller to the left. Other than a cupholder and small stowage compartment atop the dash, that’s it. It’s the cleanest and most uncluttered helm you’ll find in any small boat. As you look farther aft there are some nifty features which are executed well, but they’re not necessarily new ideas. For example, the gunwales have stowage racks for four skis. That’s pure function and certainly nothing new. The “doghouse” in the middle of the deck is also pure function. The innovative trait is that it’s as narrow as it can be, leaving a decent amount deck space to either side. 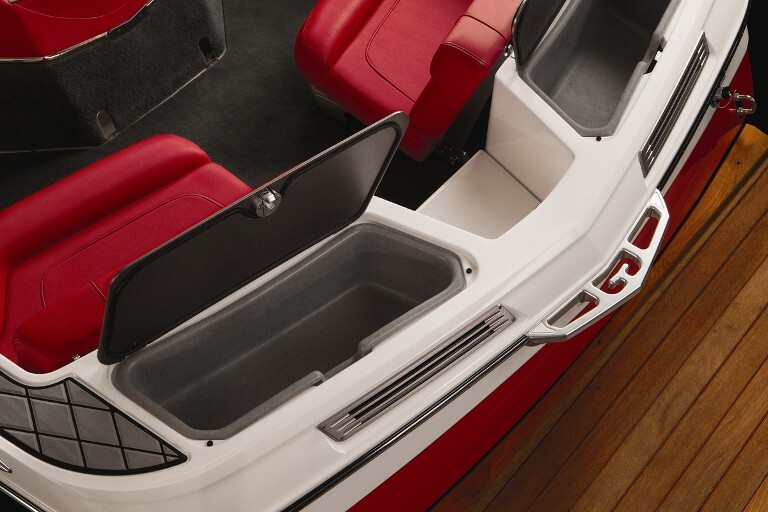 At the stern, the rear seats are fitted to each corner, leaving the middle open as a walkway to the swim platform. The seats are removable so you can leave them dockside if it’s just you and a couple of buddies skiing that morning. Less weight equals flatter wakes, you know. 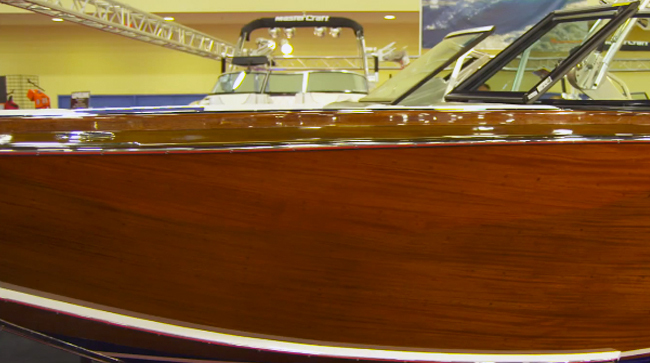 The transom has stowage compartments up top — nothing new there, but we’re glad the ProStar has them—and the platform is fabricated from classic teak. The stern of the ProStar is relatively traditional, but has the features we look for in a ski boat. Weight is important in a ski boat and MasterCraft kept it in check at 3,000 pounds, which makes its standard 320-horsepower Ilmor V8 well suited to holeshots and deep-water starts, even with more than one skier. 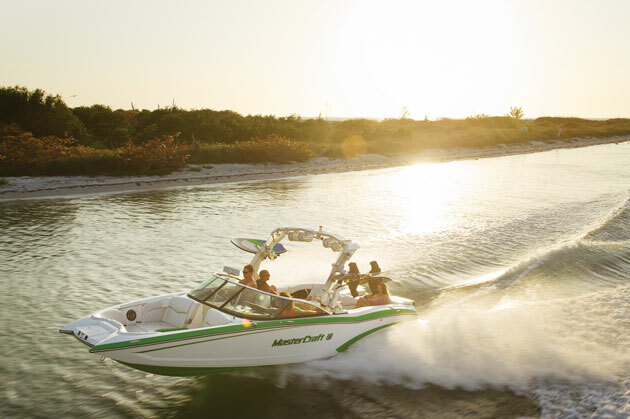 MasterCraft also fitted the boat with a small, 25-gallon fuel tank to minimize weight gain at fill-up time, which helps keep the wakes flat and soft. Though it’s true the slalom skiing market is a somewhat static, it might well be that MasterCraft could reignite it with its new 2014 ProStar. Besides, market be darned—it’s great to see an all-new slalom ski boat model to hit the water. 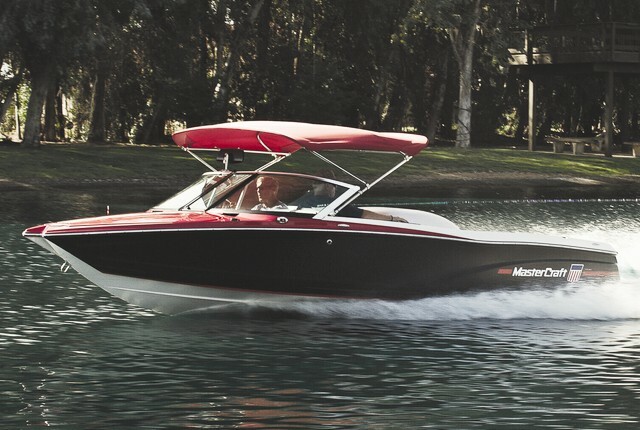 Other Choices: A similarly-sized boat which can tilt towards ski boat or wakeboarding boat and is attractively priced is the Moomba Outback. 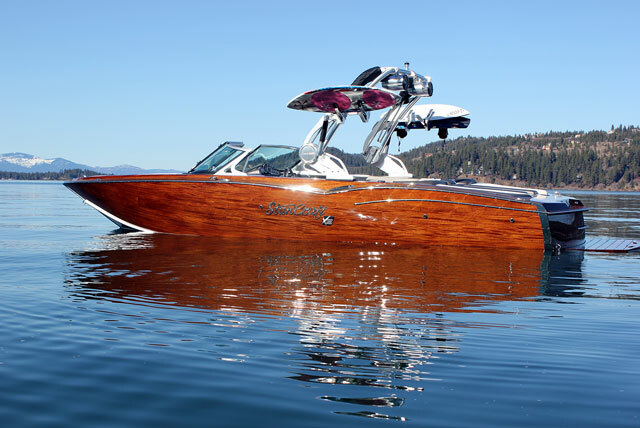 Those searching for a pure ski boat will want to check out that Ski Nautique 200.